UFC 234 Whittaker vs. Gastelum is set to take place this weekend on February 9th at Rod Laver Arena in Melbourne, Australia. 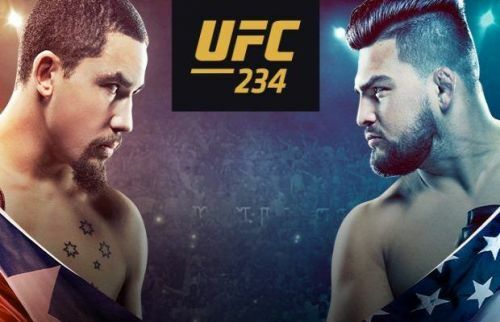 UFC 234 will be headlined by Robert Whittaker and Kelvin Gastelum. Robert Whittaker is on a roll as he is now undefeated in 9 fights. He won the Middleweight Championship after beating Yoel Romero but is yet to defend it. When his time came to defend it, Romero missed weight, turning the fight into a non title bout. Now finally he is set to face Kevin Gastelum who was his opposing team coach for Ultimate Fighter 28. The two are set to square off in the main event. In the co-main event, Anderson Silva will take on Israel Adesanya. Silva is one of the true legends of the mixed martial arts world. With his career winding down, he has not fought much recently, also having found himself surrounded by controversy. Silva will finally return at UFC 234 at the co-main event, to face Israel Adesanya -- one of the most promising up and coming fighters in the company. With Silva being a hero of Adesanya, it will be interesting to see what happens when the two clash. Location: Rod Laver Arena in Melbourne, Australia. Time: Early Preliminary Card: 6:30 PM ET, 11:30 PM GMT, and 5:00 AM IST (Feb 10th). Preliminary Card: 8:00 PM ET, 1:00 AM GMT (Feb 10th) and 6:30 AM IST (Feb 10th). Main Card: 10:00PM ET, 3:00 AM GMT (Feb 10th) and 8:30 AM IST (Feb 10th). You can watch the Early Prelims globally on UFC Fight Pass, Prelims on ESPN and Main Card on PPV.